St. Patrick's Day is upon us, and with that comes lots of celebration. And what better way could there be ensure a happy St. Patrick's Day than with some of the most fun drinking games to play at a house party with friends, especially if you stock up on some delicious green beer?! Personally, when I think of St. Patrick's Day, I think of beer, and McDonald's Shamrock Shakes, and everything decorated in green. But for others, it's true tradition. St. Patrick's Day is a worldwide celebration of Irish religion and culture celebrated every year on March 17. The day is celebrated to remember Saint Patrick, one of Ireland's patron saints, who ministered Christianity in Ireland during the fifth century. So why does everyone wear green on St. Paddy's Day? Wearing green and decorating with green and leprechaun things is a tradition that goes all the way back to the 17th century, when the Irish people wore green ribbons and shamrocks, "a young sprig, used as a symbol of Ireland ... [as] Saint Patrick, Ireland's patron saint, is said to have used it as a metaphor for the Christian Holy Trinity." Pinching people who don't wear green on St. Paddy's day is a "friendly reminder" for the Irish that the leprechauns could sneak up on them at any time. Ever since the 17th century, celebrations for this Irish holiday have involved public parades and festivals all over the world. And fun fact, St. Patrick's Day is a feast day, which means adherents are allowed to take a break from Lent and temporarily abandon their rigorous fasting in order to indulge in celebration. Because many people give up alcohol during Lent, the copious consumption of alcohol is seen as an integral part of St. Patrick's day. Green beer is a signature part of St. Patrick's Day and is consumed in generous amounts, but people don't (usually) drink it alone! They are partying as they celebrate the luck of the Irish. Here are 5 fun drinking games to play with green beer and your friends for a great house party and the happiest of Happy St. Patrick's Days. All you need is a deck of cards, a group of friends, and lots and lots of beer. Players have to guess which color the card they’re about to turn is, red or black. If they’re wrong, they drink. Keep playing till you decide to declare a winner. Pretty simple, and fun for a large group of people to play together. Pretty much exactly like the children's game — but with green beer. Players have to do as "St. Patrick" says, and whoever does or says the wrong thing at the wrong time has to take a drink. The crazier the task, the better! Who doesn't love beer pong? It's a classic game and this version is pretty much the same except, of course, with green beer. All you need is a long table, plastic cups, ping pong balls, and beer (duh!). These aren't your typical dice. 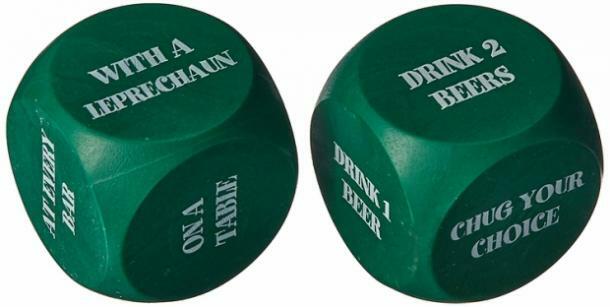 The special St. Paddy's dice is part of a fun drinking game for the adventurous adults who don't mind getting a little crazy! These dice are designed to get you to complete certain tasks depending on what you roll. Be sure to have lots of beer around for this game! Most remember hot potato from their childhood. Well, this version is a little different. All you need is a potato, shot glasses, Irish tunes, and Guinness beer. You and your friends sit in a circle with your shot glass and one person in the middle with the potato. The center person tosses the potato to someone in the circle, and they continue passing it on as music plays. When the music stops, the person holding the potato must take a shot. The game ends when only one person is left in the circle. All of these games sound like a lot of fun! Just remember to have fun this St. Patrick's day and always drink responsibly. Brittany White is a writer and a collector of crystals, moon trinkets, and mystery books.